I’ve heard good things about Rizzi’s Italian restaurant on State Street and checked out their website and discovered that they have pizza on their menu. So I’ve decided that this will be our 19th stop on the MBIP Pizza Parade. See how easy this can be? So let's head on in and let the nineteenth week of pizza begin! They have a nice looking marble-topped bar in here and since I'm making it in right before closing time, it looks like I've got it all to myself. Let's grab seat and get settled in for the evening. Here's the friendly and pretty bartender for the evening, Joy, serving up the first beer of the night. Joy just moved here with her boyfriend from Chicago. She said she's enjoying her time here and we swapped stories about moving back to P-town. I like the way the bottles are lit up and displayed down here at the end of the bar. As you can see from this display on a shelf over the top of the bar, they have a large selection of bottled beer in here. Here's Lauren who, along with her husband Dave, opened the first Rizzi's on Sheridan in 1995. They opened at this location in 1997 and now their son Bekim runs the operation. Lauren told me she was in for the evening just to help out. Here she is posing with Mike, who's a waiter here at the restaurant. He invited me back to the kitchen to take photos as he prepares this week's pie. Bekim gets right into action as we witness this Homer Simpson-like beginning to our pizza pie. Must come down! The dough has been successfully spun and now it's time to make the pie. I ordered the pizza with sausage, ham, onion and extra cheese and here's Bekim adding generous amounts of the toppings to the pizza pie. Into the oven it goes. 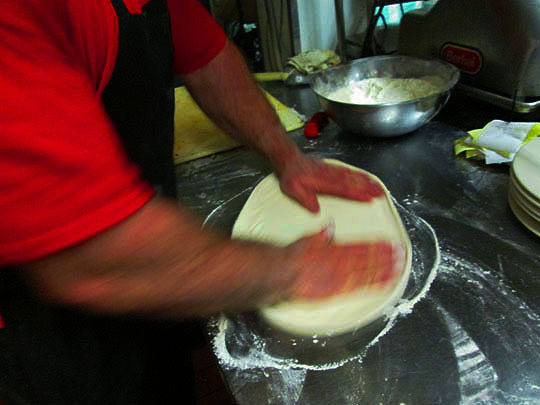 Okay, while it cooks, let's take a look around here in Rizzi's. The dining area runs along the far wall over here. Here's some tables in this nook area directly opposite the bar. There's also some booths opposite the tables along this wall in here for your dining pleasure. As you can see the outer wall in the restaurant is a celebration of all things Italian. Bekim told me that legendary bar owner, Mike "Sully" Sullivan designed this space. There's a nice outside patio area in the back for dining and drinking. Here's a shot from the back of the dining area, it's a lot bigger in here than what it looks like from the outside. And our table is all set complete with hot sauces. This week we have Tabasco and the ever-present generic Frank's Hot Sauce. No escape from Frank's! Here's Jessica serving up this week's pizza pie. Beautiful! And the pizza looks pretty good too! The pizza looks and smells fantastic. Bekim told me he spent part of his youth growing up on the East Coast and the family's pizza recipe is their version of a New York style of pizza. Here's the first slice cooling on the plate. Wow, that's really tasty pizza! The sausage is really tasty and it does bring back New York pizza memories, although this is definitely a more than a notch above your standard "Ray's Original Pizza" slice you find all over New York City. Okay, I got about halfway through and had to call it quits. They're generous with the toppings here and it's filling pizza. After dinner, Bekim bought me a Lombardi Limonata after dinner drink. It's an Italian lemonade drink and it sounds like a perfect summer drink! As the night was winding down, Bekim's pretty wife, Sindis joined us at the bar. Thanks to everyone at Rizzi's for a great pizza pie evening! Great food and wonderful hospitality! And now for the weekly cold pizza taste test the day after. And you can also see that we've reached the halfway mark in our Red Stripe six pack. Three and a half Chef Boyardees—This is the only place I know of in Peoria serving up New York style pizza that’s better than most of the pizza in New York! Related Posts: YOP @ Bacci Pizza, Veterans Pub and Pizza, Larry’s Driftwood Pizza, Norwood Pub ‘N’ Grub, Barrister’s Pizza and Pub, Mickie’s Pizzeria, Double A’s, Lucca Grill, Avanti’s, Leonardo’s, Lou’s La Grotto, Knuckles Pizza, Davis Bros. Pizza, Kenny’s Westside Pub, Dave’s Pizza, Peoria Pizza Works, Sugar and Agatucci’s. 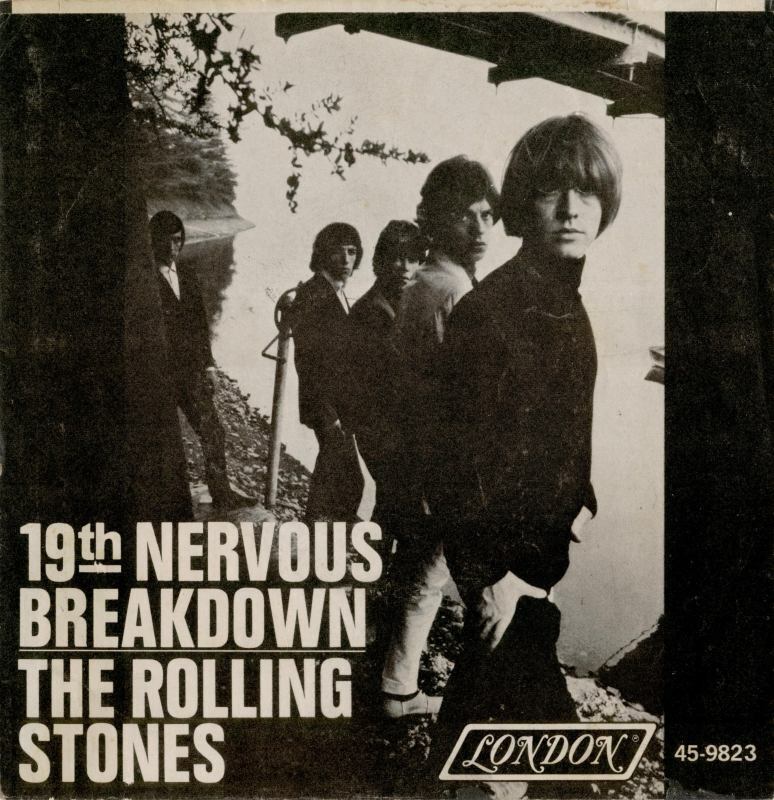 Here it comes your 19th nervous breakdown.